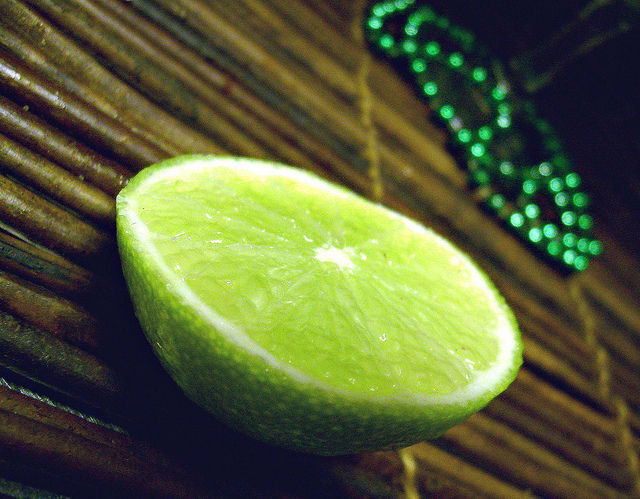 CHEERS TO ST PATRICK`S DAY! Time to move in an Irish direction…it`s soon St Patrick`s Day (or St Paddy`s Day) and i`m gonna add a splash of Irish whiskey and dress up my cocktails in green. For those who doesn`t know St Patrick´s day is a cultural and religious holiday in Ireland and also widely celebrated as a public holiday with parades etc in places such as England, Canada, the United States, Argentina, Australia, and New Zealand, among others. The colour associated with Saint Patrick was actually originally blue, but over the years it has changed to be green – and green ribbons and shamrocks were worn in celebration of St Patrick’s Day as early as the 17th century. 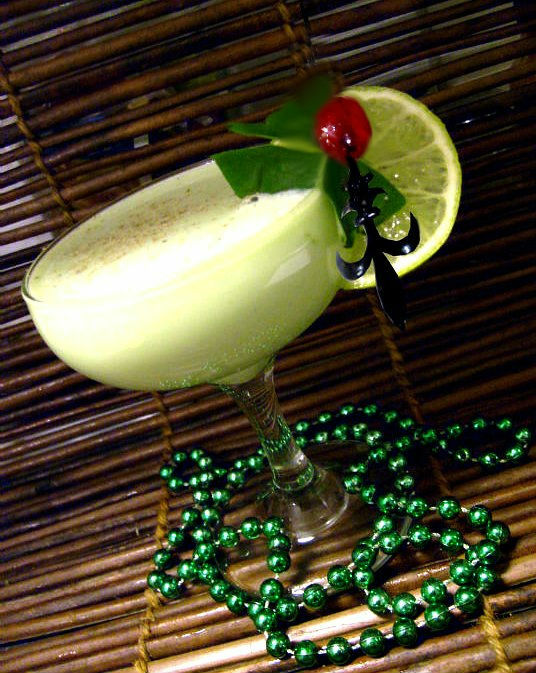 Mix in blender with cracked ice and strain into a chilled cocktail coupe, garnish with lime slice, cherry and a shamrock. I love to play with bitters, the salt and pepper of a cocktail. It´s also something very intriguing with bitters bottles…i`m sure all bitter nerds know what i mean. 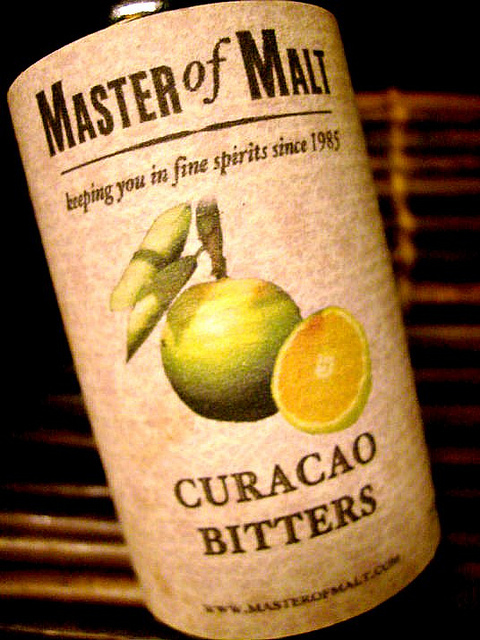 The Curacao bitters are made by the Masters of Malt. The flavor is intense bright orange/spicy. It`s a quite down to earth burnt orange flavor, that is crisp and fresh. The bottle has a dropper for exact measuring which is a very good thing. 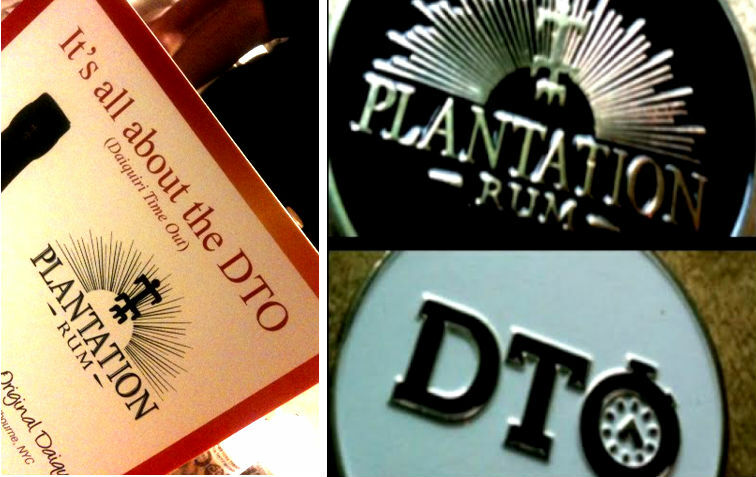 They are made using only two ingredients; the spirit (High-proof Dark Rum) and Curacao Orange Peel. There´s no additional flavourings, colourings or bittering agents added. I first gonna try them in a cocktail called “Sweet Gentleman” created by Gabriel Bessone, bartender at Warhol Sweet Point, Argentina. He also had his drink featured in the Barforum magazine in Barcelona. Ii´ts a bit changed since 2 dashes of the curacao bitters are added, the original recipe doesn´t contain any bitters. I also had to switch Jack Daniel´s for bourbon which i think is the closest even though JD is through it´s maple charcoal filtering process not referred to as a bourbon but rather as Tennessee whiskey. When it comes to the garnish it´s supposed to have a clove studded orange slice in the glass and fresh cherries but unf i didn´t have any orange at home ( i thought i had it…and it was too late for shoppping) and nice fresh cherries can´t be found this time of the year, those i have seen were all very bad. So i had to use those red ones i don´t like since they´re chemical disasters. Shaken and served in old-fashioned glass. Garnish: orange slice, 4 cloves, 5 cherries. This is a nice drink. 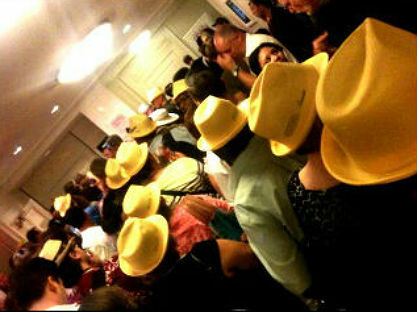 What i`ve found out is that 2 dashes of the curacao bitters is a bit too little, so try 3-4 dashes instead. It depends on what you mix with of course, but with the spicy whiskey or bourbon in this drink i think 3-4 dashes is better. 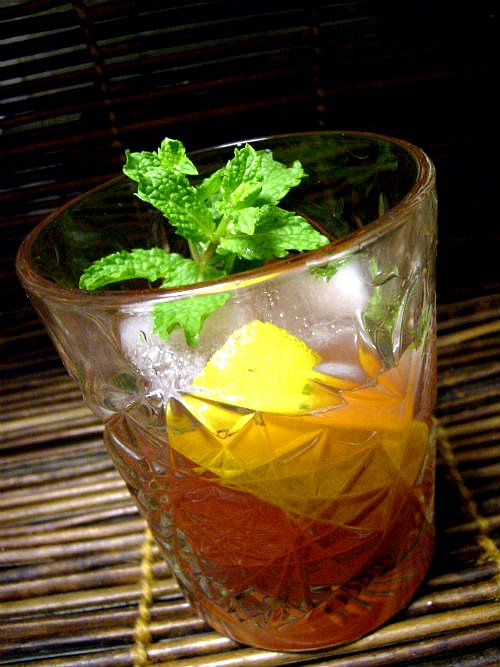 Shake and strain into a double old fashioned glass with cracked ice. Put cloves in the orange slice, cut out a pineapple chunk and drop that plus a cherry or two in the glass. I think the curacao bitters are perfect in this drink, it´s no flavor contrast but the bitters adds some depth. 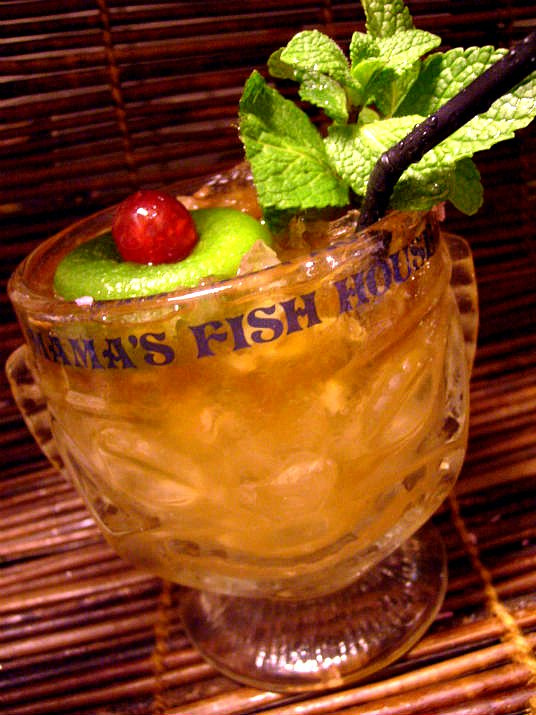 Shake with ice and spent lime shell and garnish with fresh mint, a cherry and the spent lime shell. 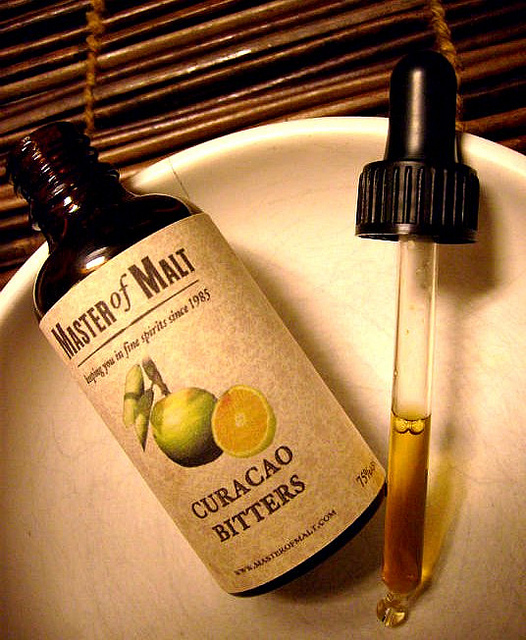 You can get the Curacao and other bitters as well as spirits at the Masters of Malt, they ship worldwide. During Tales there´s always some bitters going around and i now have five new bitters to play with and first out are 2 bitters from Miracle Miles – Chili-Chocolate and Yuzu. Miracle Miles bitters are locally made artisanal bitters that started just over a year and a half ago. Louis Anderman – the maker of these bitters became friends with Joe Keeper from Barkeeper (an awesome barware shop n LA) and would always bring him some of his homemade experiments, bitters, Nocino, etc. 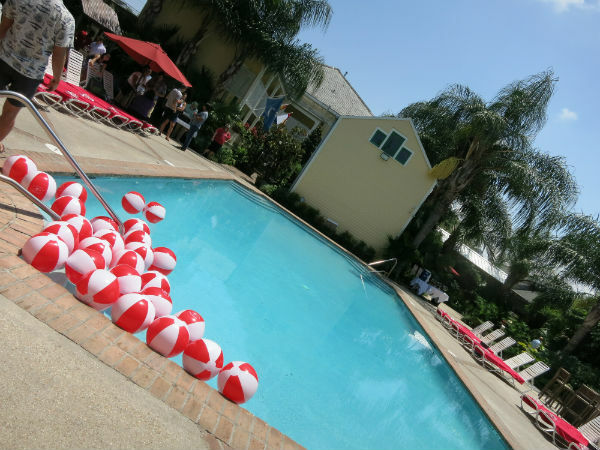 Then more and more bars started picking them up, and all of a sudden Louis was getting so much other momentum (e.g., interest from distributors) that he realized he was reaching a point where he had to go pro, or go home. Gingerbread Bitters, Castilian Bitters, Sour Cherry Bitters, Yuzu Bitters, Forbidden Bitters and finally Orange Bitters. That`s a bunch! and i don`t think they are out for purchase yet so i`m very happy i have got 2 of them. The chili-chocolate is made with fine Vahlrona chocolates and a mix of chilis. ginger, allspice and nutmeg, sweetened with molasses and maple syrup – with a slight chili bite. 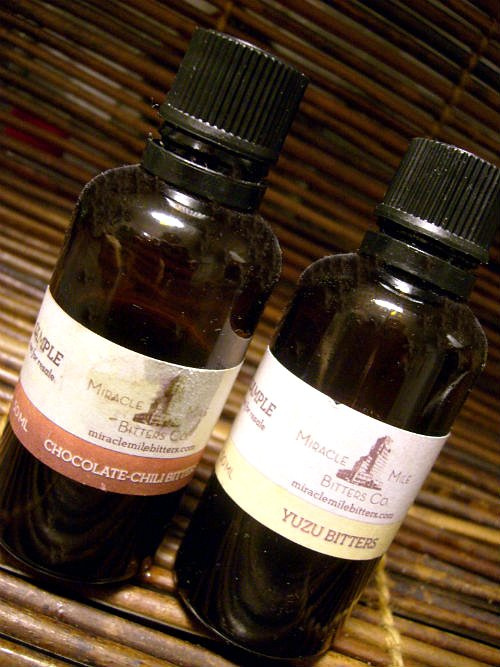 The chocolate-chili bitters are perfect for dark rum drinks as well as bourbon, rye, tequila and well – any dark spirits really – anything that goes with well chocolate. People also use them on ice-cream and coffee..mmm – i´m gonna try them with my blend of Community Coffee Nola blend with chickory and Pecan-Praline…oh my.. 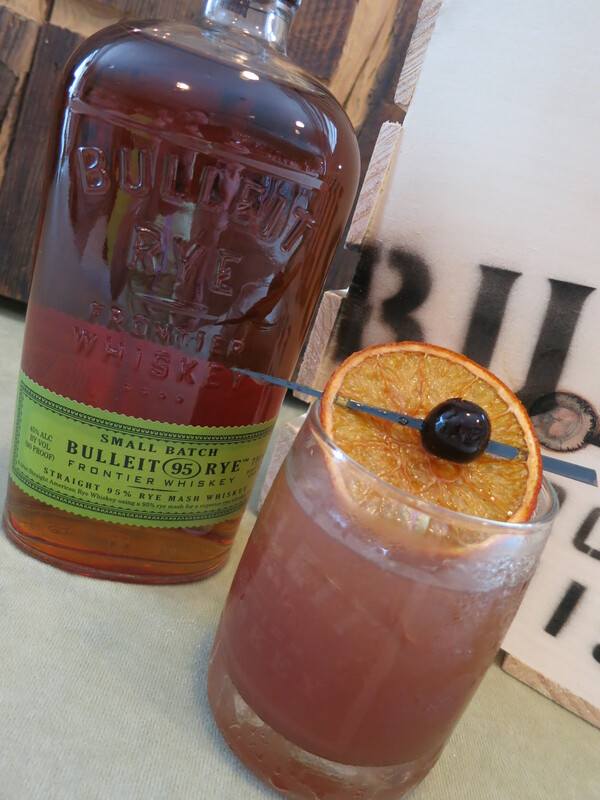 I stumbled upon a drink when i was sitting and reading an article about whiskey cocktails in Hawaii. Since ii like both cocktails, whiskey and Hawaii they had my attention. 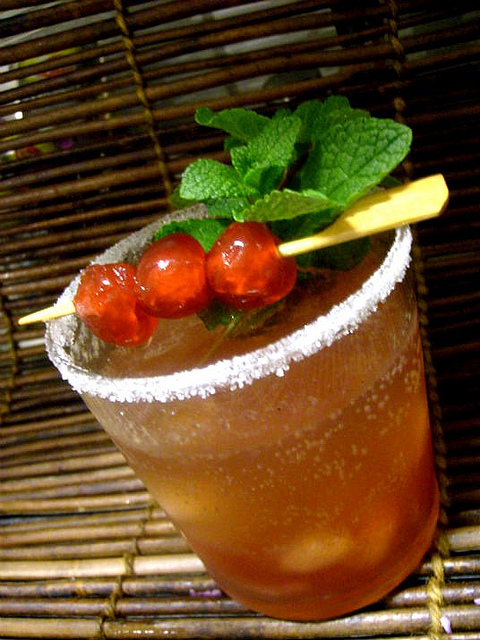 The Whiskey Thatcher was created by Dave Newman, bar manager of Nobu, Honolulu, Hawaii who was wondering if the Thatcher would work with whiskey which apparently it did. Today people want spirits with more character – and i see whiskey coming back and also other flavorful, handcrafted spirits like rum, tequila and mezcal. Even vodka producers are going in that direction creating small batch vodkas with flavor – one example is Karlsson´s which contains 12 different potatoes. 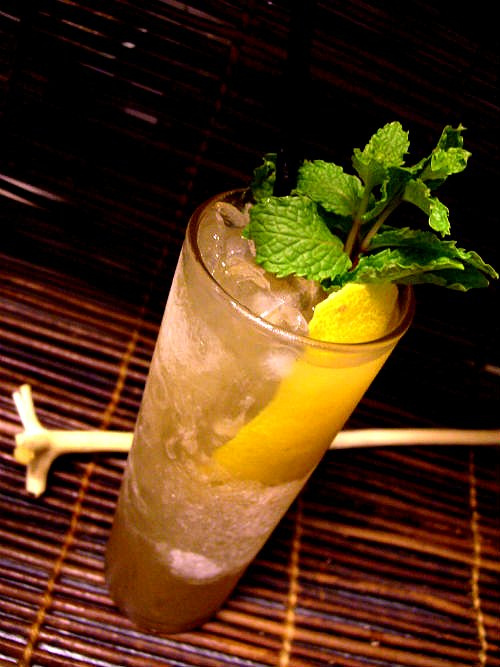 The Whiskey Thatcher blends citrus and sweet, herbal and bitter with the depth and roundness of the whiskey. 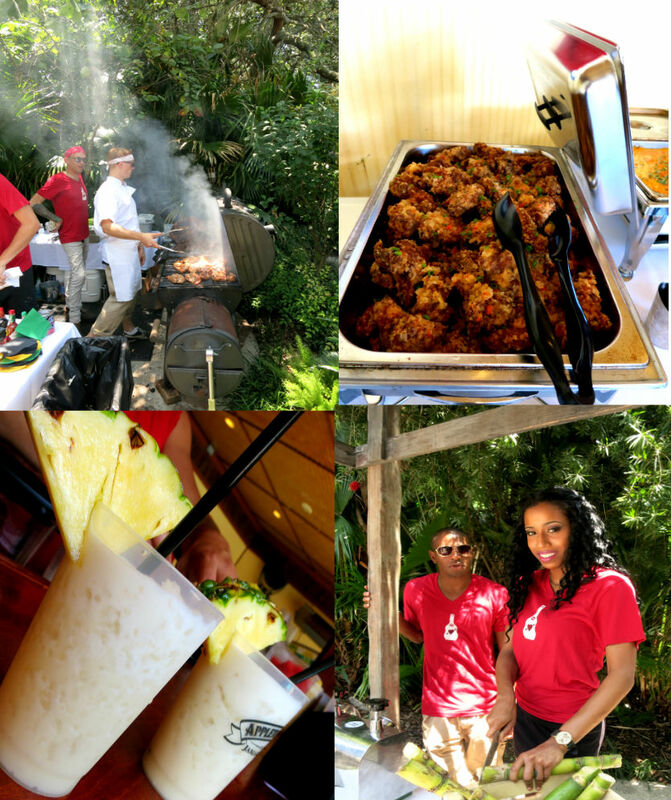 And besides, anything that contains campari is worth trying i think. 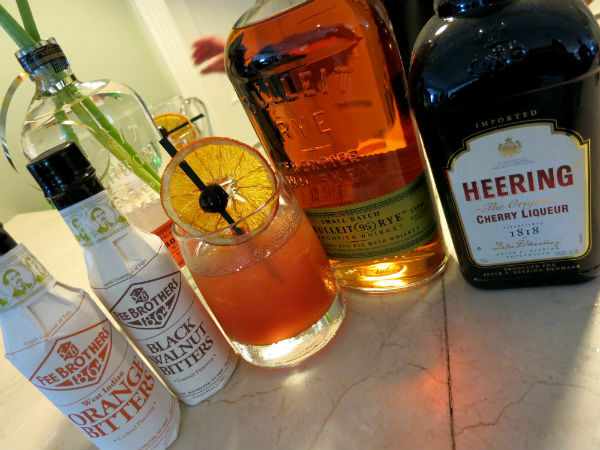 So here we go – the Whiskey Thatcher with dashes of chili-chocolate bitters! Muddle a slice of lemon peel, two or three mint leaves, 1/2 ounce Campari and 1 teaspoon of fine sugar in a mixing glass. Add 1. 75 oz bourbon, and a splash of hibiscus syrup and fresh juice from half a lime. 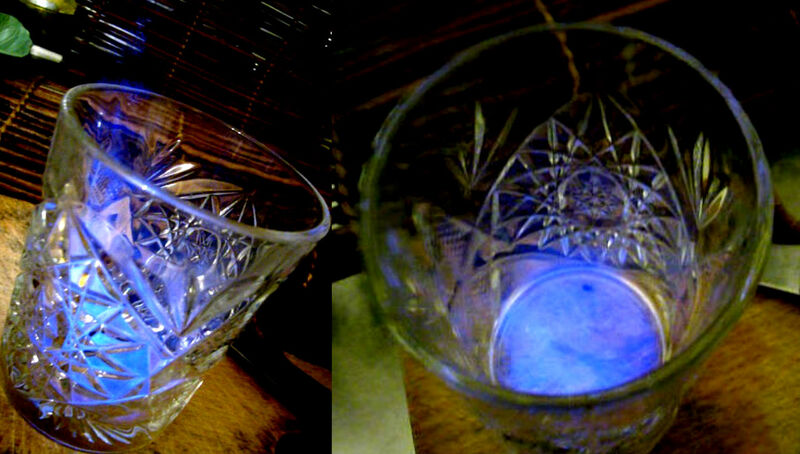 Put a splash of pernod and a splash of bourbon (the recipe calls for Wild Turkey but i had Maker`s Mark on hand) in the bottom of another (slightly preheated) lowball glass, light it on fire and burn off the whiskey and pernod. And fresh ice; and strain the drink from the first glass into the prepared glass and stir. From that i moved on to mix me this next drink because Louis told me to try it – 2oz demerara rum, 1/2 oz pineapple gomme, 2-3 dashes chocolate/chili bitters, built like an old fashioned – and indeed it was good – very aromatic and deep. Now after these two very satisfying cocktails with dark rums it was time to try out the Yuzu bitters. Released only a few months ago, it’s quickly catching up to the Chocolate/Chili in popularity in LA, and KL Wines in SF sold out of a full case within five days. 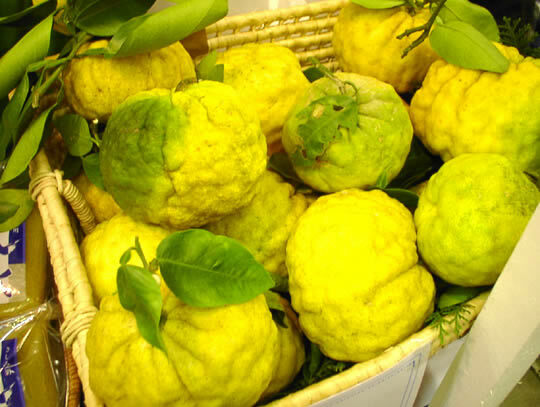 In addition to the yuzu, cinchona is used for the bitter plus cardamom, cinnamon, and burdock root among the other spices, and two kinds of green tea to round out the finish. Here`s a link to pictures of Yuzu. These bitters would go well with anything that goes with citrus and i`m sure also with herbal liqueurs and so therefore i decided to try a variant of the Chartreuse swizzle adding Yuzu bitters thus turning it into a Yuzu Swizzle. Add ingredients to a large glass full of crushed ice. Swizzle to mix, lavishly garnish with mint, squeeze a bit and add a few extra dashes of the bitters on top of the ice as well. After trying this i can say that it is tasty – no doubt – but i wonder if the yuzu and the green chartreuse might play out each other a bit…i cannot detect the flavors of the yuzu so clearly. 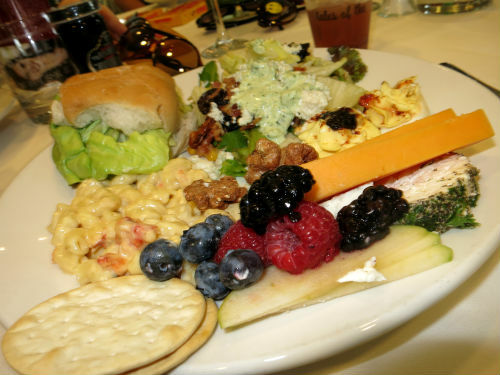 Nevertheless – tasty it is. But i needed something “cleaner” to give the yuzu bitters space to play and the flavors to shine a bit more.. So how`bout a Yuzu daiquiri? Now this was better in the sense of putting the yuzu flavors more forward and a Daiquiri is always a very nice cocktail – one of my favorite cocktails. This has been fun and i`m very pleased with the Miracle Miles bitters, go try them when you get a chance. Made in honor of Jackson Square, this cocktail with whiskey and fruit juices is a tasty libation indeed. 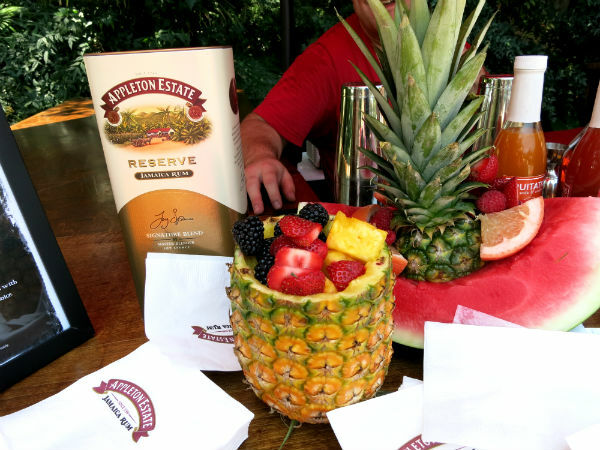 It can be found in the book “Famous New Orleans Drinks and How to Mix `em” by Stanley Clisby Arthur. I can´t find any info on what year this cocktail was made and by whom and any history about how it got its name etc but the book was written in 1937. So there isn´t much to write about this cocktail here, rather get going and mix it up – but in any case, the cocktail is nice and i like Jackson square, one of the many interesting historic places in New Orleans. Jackson square was originally called Place d´Armes (Spanish: Plaza de Armas) in the 18th century but was re-named to Jackson Square in honor of the Battle of New Orleans hero, Andrew Jackson who now since 1856 stands In the center of the parkas an equestrian statue – or a statue of a rider mounted on a horse. 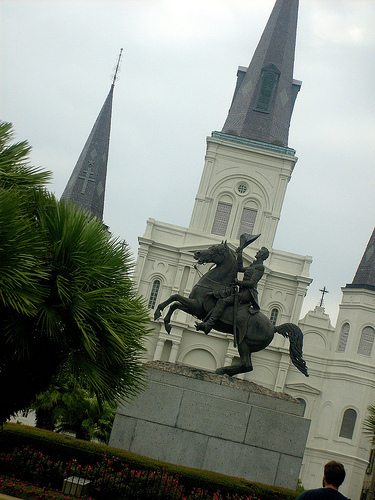 The design of Jackson Square was modeled on the famous Place des Vosges in Paris, France and did originally overlook the Mississippi River across Decatur Street. And here is where one of my favorite restaurants is – Muriel`s with its mystic 2nd floor rooms that are just amazing. Also here is where for well over a half century now there`s artists painting and displaying their work on the outside of the iron fence. Squeeze the fruit juices in a mixing glass. Add the sirup; be careful not to make it too sweet if you like a dry drink . . . Otherwise use a little sugar. Then add the whiskey—some prefer Bourbon, others rye. Strain into a tall glass half-filled with crushed ice. Decorate with a sprig of mint, after frappeing well with a spoon. This cocktails is very tasty and fresh! i was wondering if 1 oz of grenadine would be too much but it isn´t – but its importsant to use a good quality grenadine. 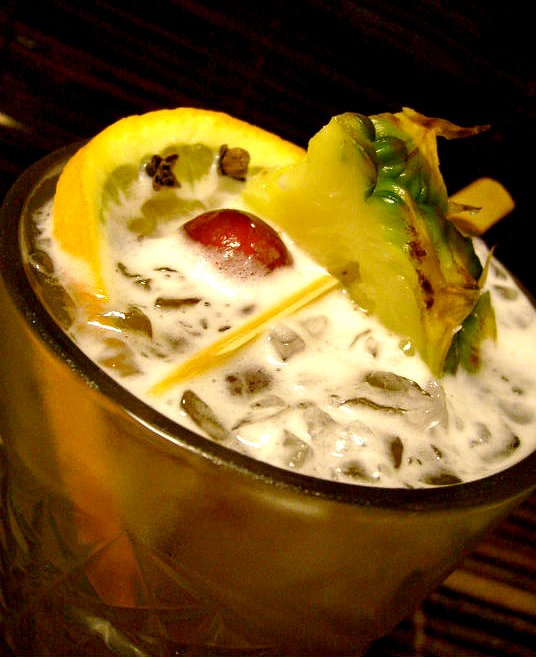 I strongly recommend homemade hibiscus grenadine – or Trader Tiki´s. Also use a good quality rye or bourbon in this. The fragrance of the lightly bruised mint that blends so well with the fresh lemon and warm vanilla scent is heavenly..
A mix of lemon, rye whiskey and vanilla syrup topped off with fragrant mint, is a sure good drink to beat the cold of the winter. Its friggin`minus 11 degrees F (-24C) here now, or at least it was yesterday in the morning and i am not a winter person at all, i freeze under 60 and prefer temps in the 90s so i sure need something to keep me warm and the Vanilla Smash is a good drink. Its just my take on the Whiskey Smash, adding some warm fragrant and soothing vanilla in the mix. Many recipes uses Bourbon but i found one in Jerry Thomas 1862 “How to Mix Drinks” that uses rye instead. This drink is very close to the Mint Julep and if you add some passionfruit syrup and grenadine you get the PortLight. How to mix is the same as with the Vanilla Smash. 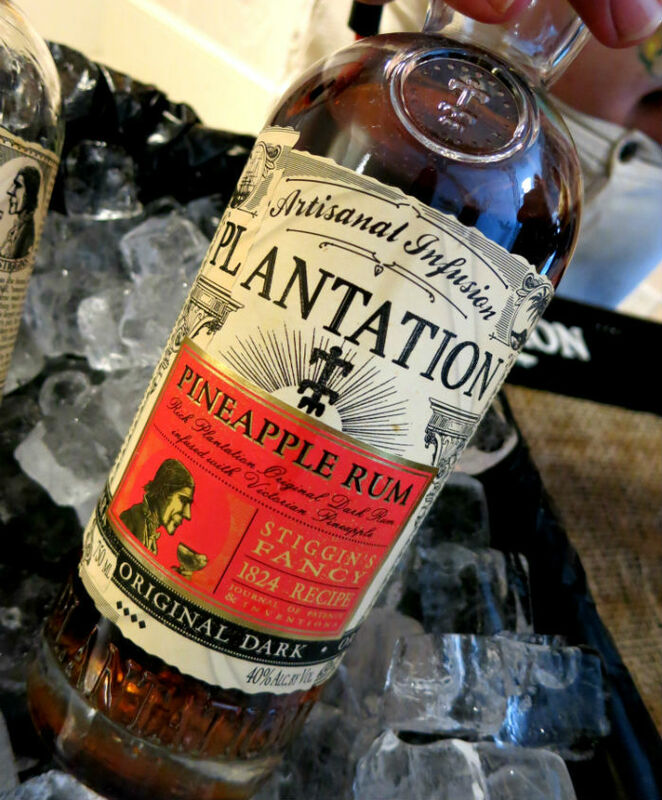 Usually i mostly drink rum but i also like whiskey…and in any case i like spirits that`s got natural flavor and personality. The vanilla i´m using here is a homemade vanilla syrup made with Tahitian beans which i think are the best. I would also warmly recommend Trader Tiki`s vanilla syrup which is outstanding and would do the job just as well. In a shaker, muddle the lemon wedges to get the essential oils into the drink along with the fresh juice, then add the mint and lightly bruise the leaves but not too hard to avoid bitterness. 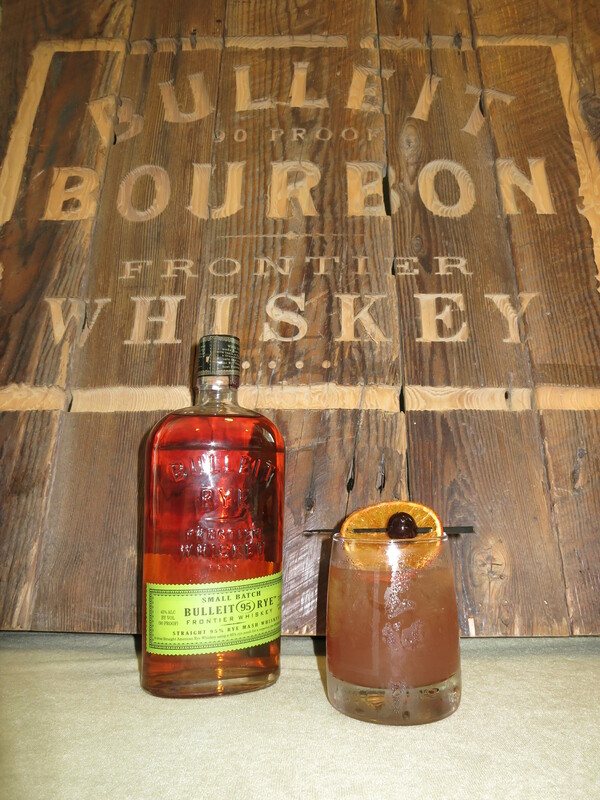 Add rye and vanilla syrup Shake vigoriosly with ice and strain into a rocks glass with ice chunks. Garnish with a vanilla bean. There´s something i particularly like with this cocktail..the fragrance of the lightly bruised mint that blends so well with the fresh lemon and warm vanilla scent is heavenly.. The flavor is ridiculously tasty, i think i have a winner here! one of those that i will keep in rotation. Freshly made vanilla syrup with light muscovado sugar.